Verified First, the premier background and drug screening company in North America, announced a partnership with Compass Business Solutions, an organization offering an array of outsourced human resource and business solutions for organizations of all sizes. This partnership will make powerful background screening tools available to clients that rely on Compass for effective HR solutions. To streamline HR functions, Verified First can be integrated with an Applicant Tracking System (ATS). This integration can be completed within minutes at no cost to the user. Once complete, Verified First’s portal allows users to request a variety of background screenings on prospective employees. The portal interface is intuitive and designed to encourage users to comply with FCRA and EEOC laws that govern background screenings, making it easier to follow these important regulations. These features, combined with Verified First’s proprietary technology, significantly improve time-to-hire when screening candidates. These features are a valuable addition for Compass as they provide best-in-class HR solutions for organizations of all sizes, ranging from startups to Fortune 500 companies. Whether a clients’ focus is growth, cost or a new business model, Compass’ talents and tools are employed to optimize an organization's revenue growth, leadership effectiveness, employee productivity, talent management, customer value and business processes. Streamlined pre-employment screenings improves both the candidate experience and overall hiring process; therefore, a partnership between Compass and Verified First is a natural fit. “Compass excels at identifying and providing thoughtful, personalized HR solutions. We’re excited to work with their clients to help them optimize their hiring process,” said Michael Lotterstein, Vice President of Verified First. Compass’s leadership team were also enthusiastic about this new partnership. 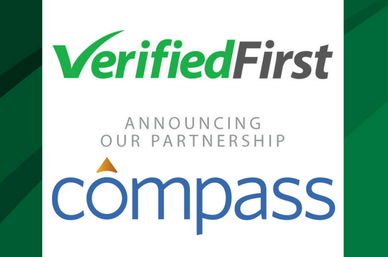 “We look forward to strengthening our partnership with Verified First in an effort to continue to provide our clients with streamlined hiring support,” noted Alisa Spector Angelo, President of Compass Business Solutions.